It is a D01 2 band 26/54 in the Raptor handle in Gold Coast. The color has a touch more orange than the picture shows. I think it is fantastic. I got it through a group buy on The Shaving Room, the English shave forum. The savings were substantial. I have not tried a quality badger brush, so I am looking forward to using it. I have been using synthetics exclusively for months now. I certainly hope it gets softer. My CH2 synthetic and others were much, much softer on arrival. I've grown accustomed to the backbone of the CH2; I think I am going to like this new brush. You can expect a ton of scrub compared to the synthetics you are used to. D01 2 Band was too much feel for me. Congratulations on the lovely brush! Talk about polar opposites; synthetics to D-01 2-Band! You'll definitely encounter a great deal of backbone with very pronounced scrub. Thanks for the comments. I had considered going with the 3 band, but I had read such raves about the 2 band that I could not pass it up. First time use: I like the size of the handle. I had been using a L'Occitane Plisson and a Whipped Dog 22 for quite a while before I got the CH2 synthetic, so this one is significantly bigger. I wasn't too sure about the leap to the 26 knot - I thought I was going to end up with soap going everywhere, but it works nicely. It is very scrubby so far, quite a change from the Plisson and WD, but less so from the dense CH2 synthetic. When I wet it for the first time: whoa, badger funk smell! I like some variety in the shaving experience so this brush should be just fine. It looks great in my little display of shaving gear. It will increase my rate of soap consumption. And that is not a bad thing. I've got some Cella I've been trying to kill off since Christmas. I have no doubt that one should use a synthetic if cost and soap conservation are concerns - a few rotations on the soap and you are ready to go. The Shavemac is going take some more loading. The end result of my Shavemac purchase might be that I appreciate my CH2 synthetic even more. Good luck with the brush and allow, at least, a few months for it to soften up.....or a bit longer. This D-01 hair can take some time to really soften up. Have fun. Nice brush! If you do end up finding it too scrubby, don't give up on two-band or Shavemac; it could just be that the D01 is not for you. 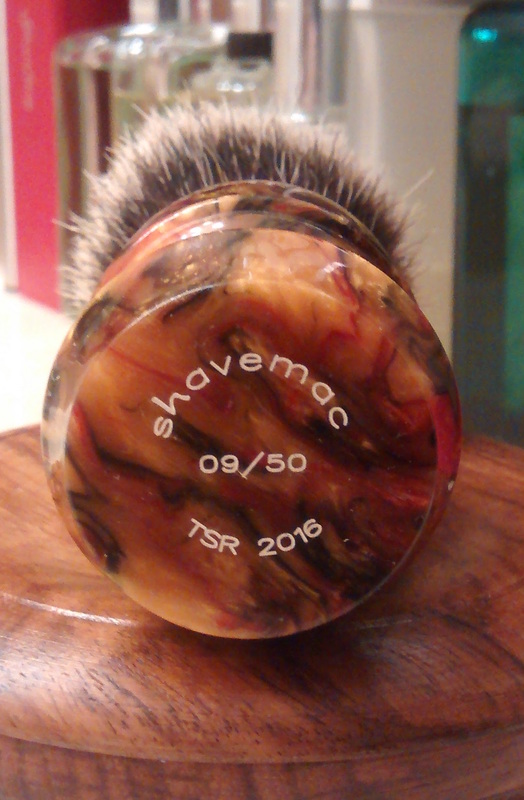 I have a standard two-band Shavemac (26/56 bulb) and it's wonderful; not scrubby but nice backbone. I also have a Shavemac #177 three-band silvertip that is a soft luxury to use. It's all a matter of what you end up preferring, but these are great brushes.